Hello and welcome to week 258, thank you for all your support and feedback, we are very grateful for your visits to the blog from all of us at Isabel’s Beauty Blog.In this post we are sharing information on Breathing, We often get asked why do you have posts about health concerns, nutrition and spiritual matters, it is very a simple answer actually, for us it is a connection of body, mind and spirit that we all share and there is not doubt in our minds about it. I grew up with that knowledge and in the history of the planet these facts are well documented, with that said, it is commonsense if you think about that if you are not happy it definitely shows in our overall looks, even when we are extreme beauties, the unhappy attitude won’t really take us far when we have imbalances either internally or externally, there is something about that that is not so beautiful won’t you agree? 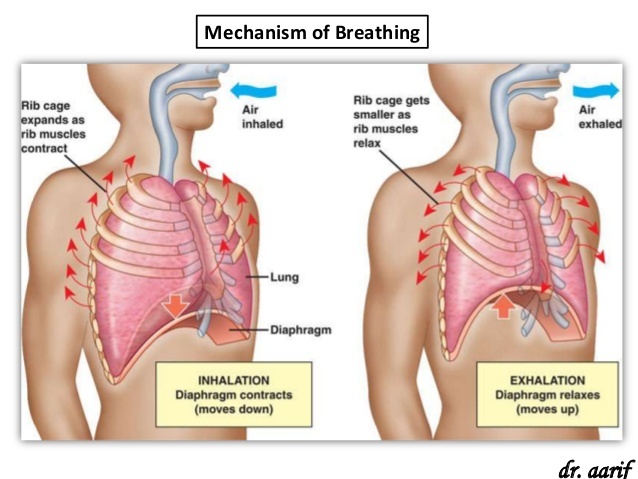 So breathing is one of those facts that is imperative to address. In Chinese Medicine the lungs rule skin!! so there is a great reason to keep the respiratory system in top shape. Posture plays a great roll on breathing and incorrect posture is not very beautiful, so as you can see the overall balance is what keeps our external and internal beauty in shape. Enjoy the post and remember to share with family and friends, we wish you health, happiness and ideal wealth. 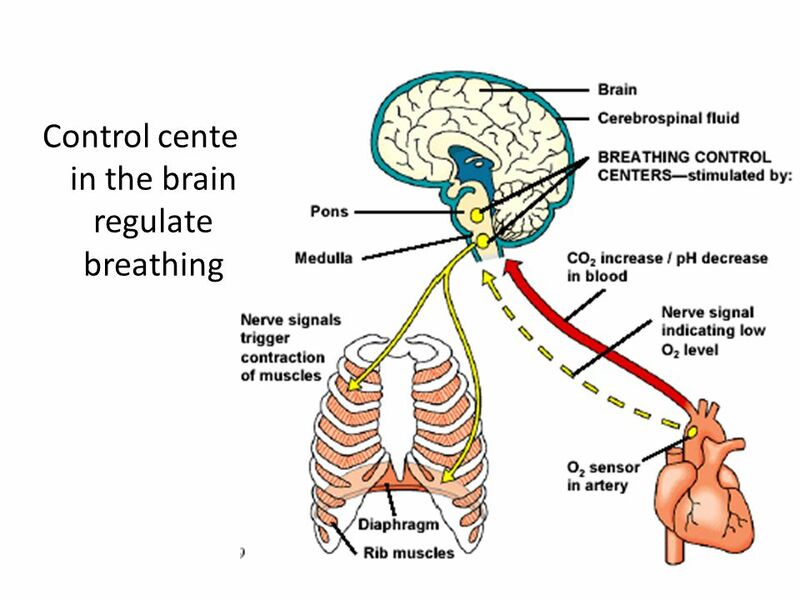 At the base of your brain is a respiratory control center that controls your breathing. This center sends ongoing signals down your spine and to the muscles involved in breathing. These signals ensure your breathing muscles contract (tighten) and relax regularly. This function allows your breathing to happen automatically, without you being aware of it, is pretty amazing don’t you think aside from al the work that the body does with us running around all day!. To a limited degree, you can change your breathing rate, such as by breathing faster or holding your breath. Your emotions also can change your breathing. For example, being scared or angry can affect your breathing pattern, thinking, crying, excited etc,. Your breathing will change depending on how active you are and the condition of the air around you. For example, you need to breathe more often when you do physical activity. In contrast, your body needs to restrict how much air you breathe, if the air contains irritants or toxins to protect us from it. To adjust your breathing and changing needs, your body has many sensors in your brain, blood vessels, muscles, and lungs. 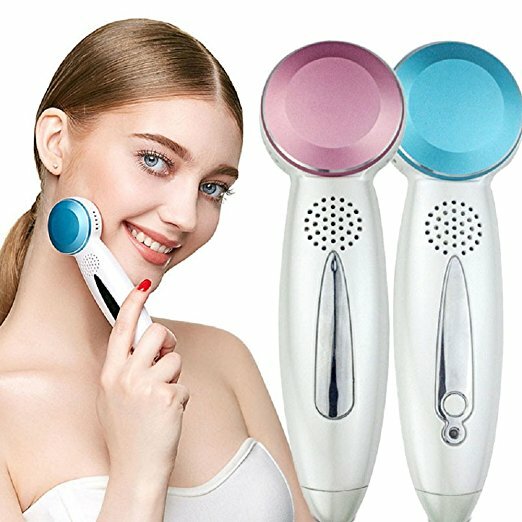 Sensors in the brain and in two major blood vessels (the carotid (ka-ROT-id) artery and the aorta) major blood vessels,detect carbon dioxide or oxygen levels in your blood and change your breathing rate as needed, it is just amazing what the body does and we are not even aware of its work. Sensors in the airways detect lung irritants. The sensors can trigger sneezing or coughing. In people who have asthma, the sensors may cause the muscles around the airways in the lungs to contract and tighten. This makes the airways smaller. Sensors in the alveoli (air sacs) can detect fluid buildup in the lung tissues. These sensors are thought to trigger rapid, shallow breathing. Sensors in your joints and muscles detect movement of your arms or legs. These sensors may play a role in increasing your breathing rate when you’re physically active. When you breathe in, or inhale, your diaphragm contracts (tightens) and moves downward. This increases the space in your chest cavity, into which your lungs expand. The intercostal muscles between your ribs also help enlarge the chest cavity to contain your different amounts of air inhaled. They contract to pull your rib cage both upward and outward when you inhale. 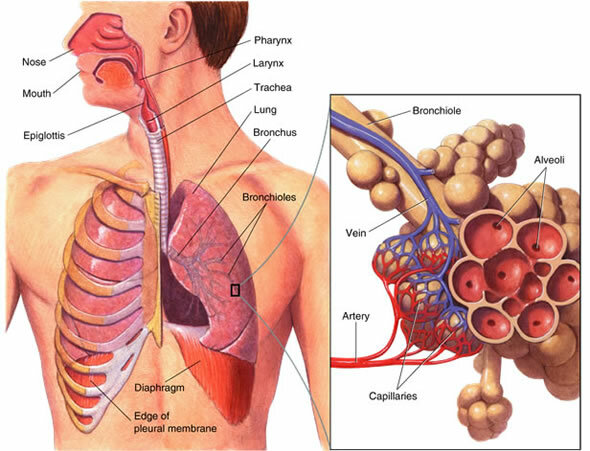 Oxygen-rich blood from the lungs is carried through a network of capillaries to the pulmonary vein. This vein delivers the oxygen-rich blood to the left side of the heart. The left side of the heart pumps the blood to the rest of the body. There, the oxygen in the blood moves from blood vessels into surrounding tissues. 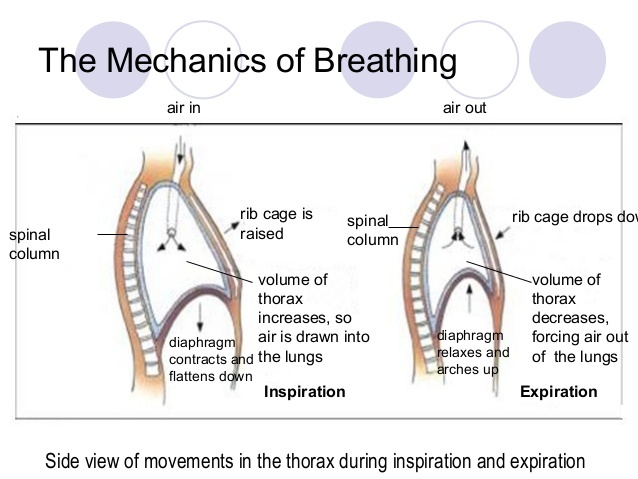 When you breathe out, or exhale, your diaphragm relaxes and moves upward into the chest cavity. The intercostal muscles between the ribs also relax to reduce the space in the chest cavity. As the space in the chest cavity gets smaller, air rich in carbon dioxide is forced out of your lungs and windpipe, and then out of your nose or mouth. Breathing out requires no effort from your body unless you have a lung disease or are doing physical activity. When you’re physically active, your abdominal muscles contract and push your diaphragm against your lungs even more than usual. This rapidly pushes air out of your lungs. When you breathe, you inhale air and pass it through your nasal passages where the air is filtered, heated, moistened and enters the back of the throat. The esophagus (food tube) is located at the back of the throat and the trachea (windpipe) for air is located at the front of the throat. When you eat, a tiny flap called the “epiglottis” closes down to cover the windpipe so food won’t go down the wrong pipe. Here it is important to remember that breathing is meant to be done through the nose not the mouth for very specific biological reasons!. This phenomenal exchange works with the assistance of the red blood cells in your bloodstream. Your red blood cells are like boxcars on a railroad track. They will show up at the sacs at just the right time, ready to trade in old carbon dioxide that your body’s cells have made for some new oxygen you just breathed in. During this process, the red blood cells turn from purple to a sparkling red color as they start carrying the oxygen to ALL the cells in your body. The carbon dioxide (waste) that your body made and now can’t use will go through the lungs, back up your windpipe and out with every single exhale. 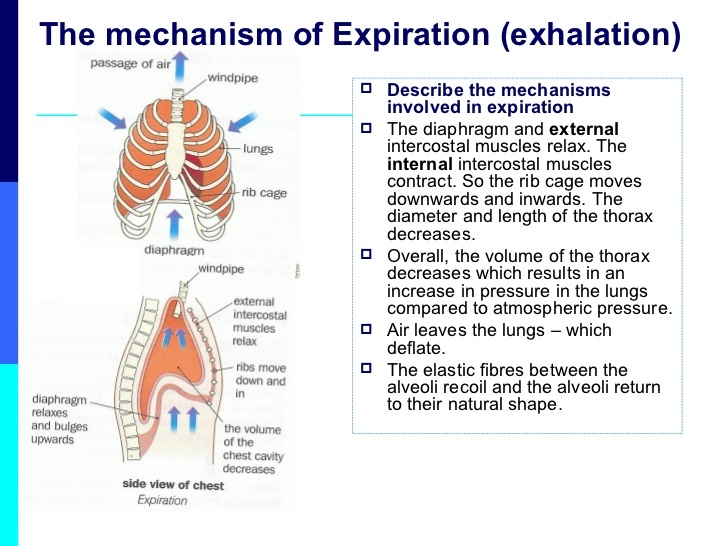 This is a chemical exchange of breathing in and out (inhalation/exhalation). This is an automatic process that you don’t even have to think about. Unless of course, you smoke, then you’d be depriving ALL of your cells of oxygen. 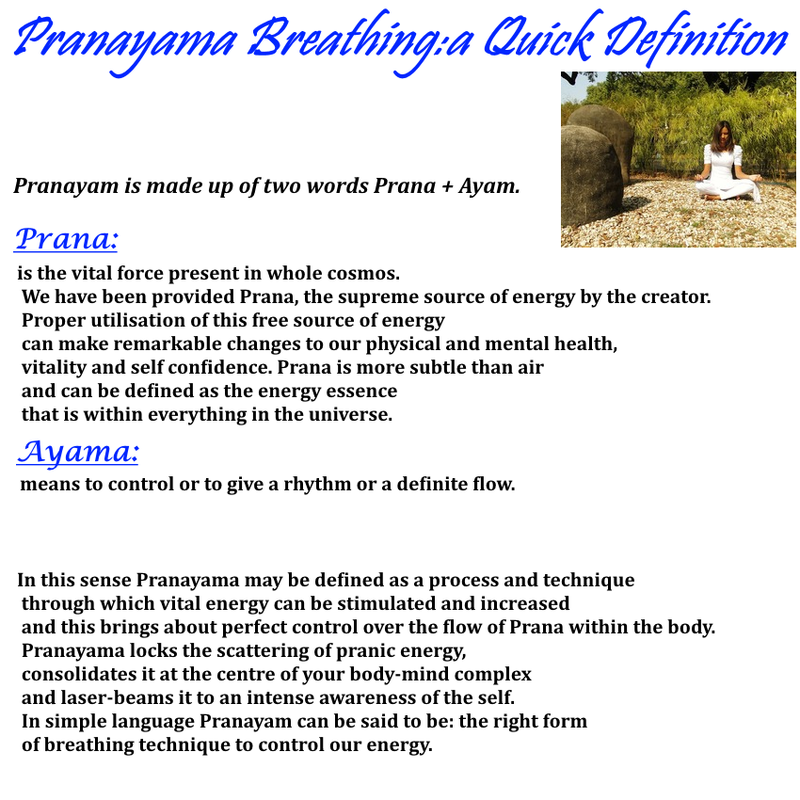 What is Prana and Where Did Pranayamas Come From? These original yogic seers observed the power of the breath to increase one’s prana and developed special breathing techniques to increase life energy, maintain health and create a calm, clear state of mind that is conducive for meditation. 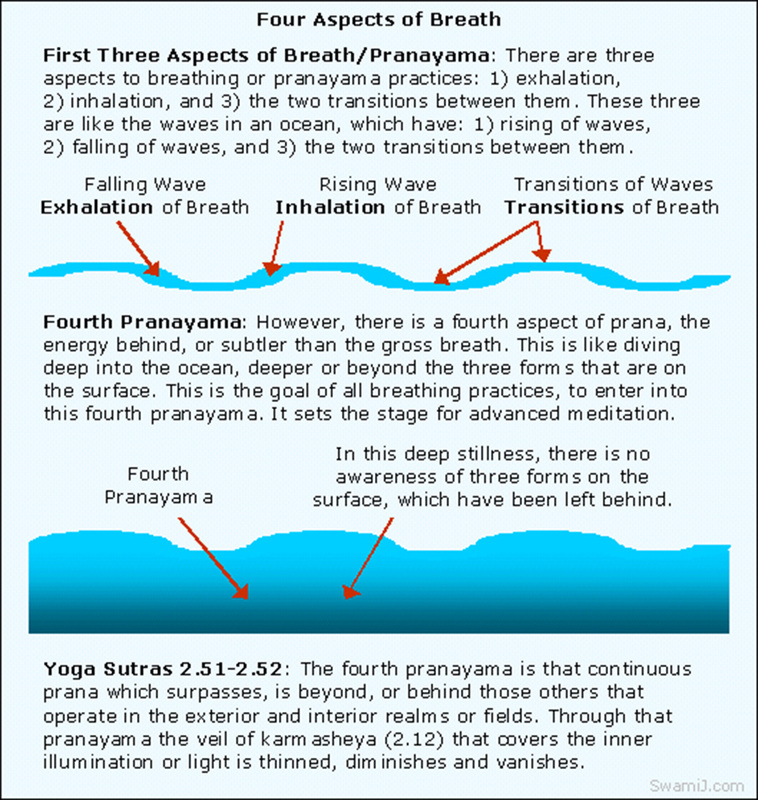 Where do the sources of Prana come from? We get prana from food, rest, breath and by being in a calm, happy frame of mind. There is more prana in fresh foods than canned ( it really relates to life force), frozen or stale foods. Similarly, vegetarian foods a said to be generally of high prana, while meat, being dead, is considered low or even negative prana, the fresher the source the more life in it, doesn’t that make sense?. Sources of Prana can be found in fresh food than canned ( it really relates to life force), frozen or stale foods. Similarly, vegetarian foods is said to be generally of high prana, while meat, being dead, is considered low or even negative prana, the fresher the source the more life in it, doesn’t that make sense?.are And, as we will see in a moment, the way we breathe has a powerful effect on how we feel. It was discovered thousands of years ago that the quantity and quality of prana and the way it flows through the nadis (subtle energy channels) determines one’s state of mind, if you notice when we are stressed we hold our breath and bread from the top of our chest instead of our lower lungs. Due to lack of attention, the energy channels in the average person may be partially blocked, making the flow of prana broken and jerky. 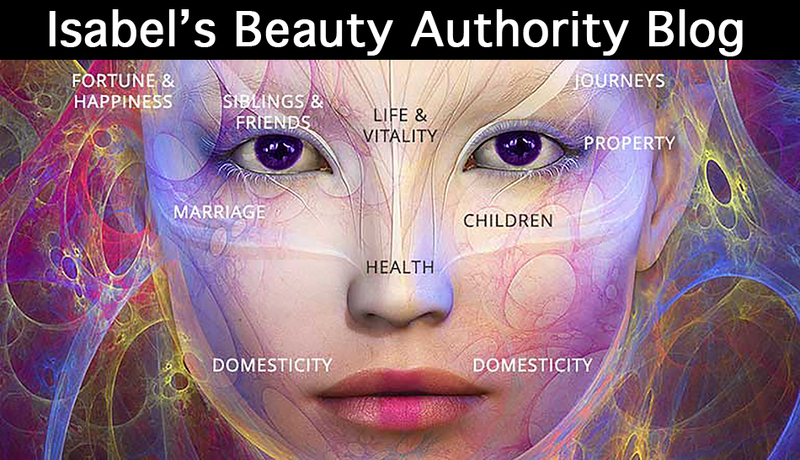 This results in increased worry, fear, uncertainty, conflict, tension and other negative emotions. When the prana level is high and its flow is continuous, smooth and steady, then the mind is calm, positive and enthusiastic. Breath is essential to life. It is the first thing we do when we are born and the last thing we do when we leave. In between that time, we take about half a billion breaths more less every one is different. What we may not realize is that the mind, body, and breath are intimately connected and can influence each other in a very deep way. Our breathing is influenced by our thoughts, and our thoughts and physiology can be influenced by our breath. Learning to breathe consciously and with awareness can be a valuable tool in helping to restore balance in the mind and body. 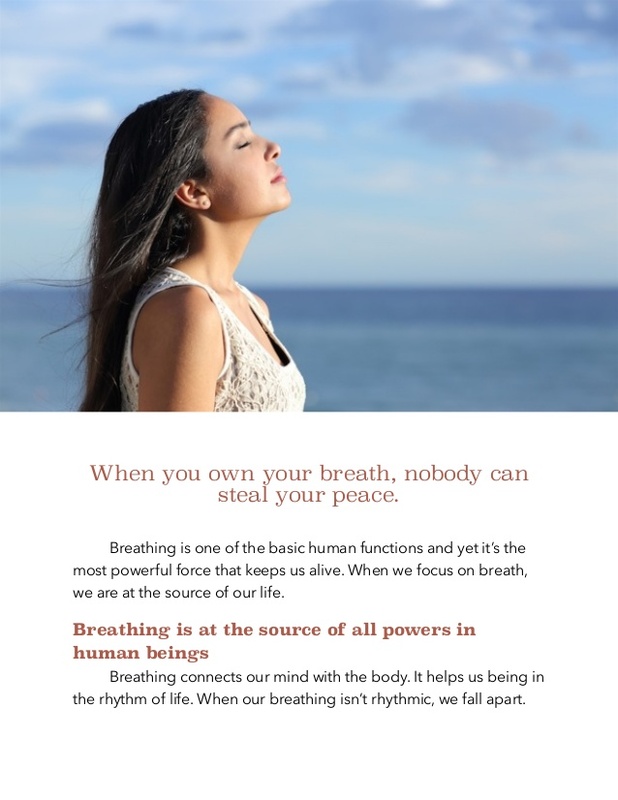 In the medical community, there is a growing appreciation for the positive impact that deep breathing can have on the physiology, both in the mind and the body. According to the research, many of these beneficial effects can be attributed to reducing the stress response in the body, by that reducing inflammation mentally and physically. To understand how this works, let’s look at the stress response in more detail. When you experience stressful thoughts, your sympathetic nervous system triggers the body’s ancient fight-or-flight response, giving you a burst of energy to respond to the perceived danger. Your breathing becomes shallow and rapid, and you primarily breathe from the chest and not the lower lungs this action accelerates the heart beat influencing blood pressure, relating adrenaline now the Adrenal glands get compromised and so on. This can make you feel short of breath, which is a common symptom when you feel anxious or frustrated. At the same time, your body produces a surge of hormones such as cortisol and epinephrine (also known as adrenaline), which increase your blood pressure and pulse rate and put you in a revved up state of high alert the whole system is in alarm mode. The Vagus nerve is a huge deal, and what activating this nerve does to the entire body system. 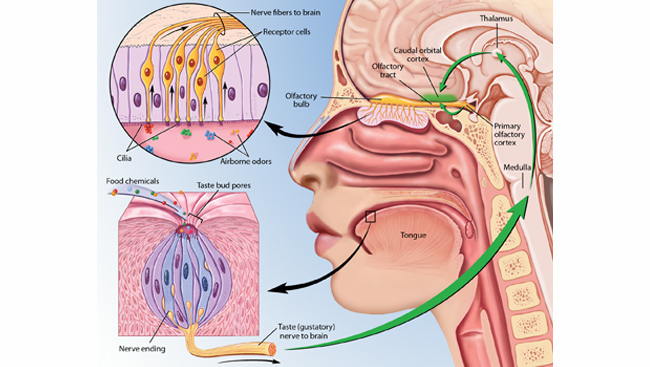 We can activate this nerve with our breath, check the image below so you can get an idea how tremendous effect this nerve has on our wellbeing. 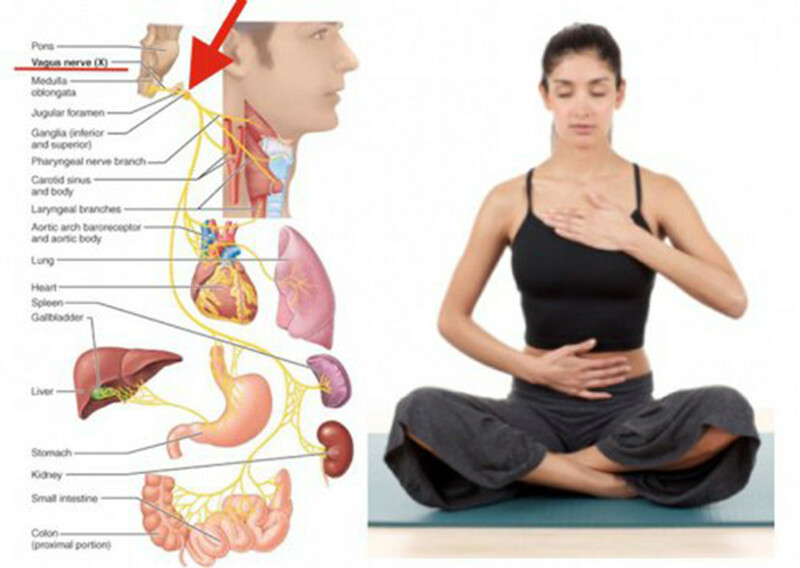 In addition, with deep breathing, you engage the abdominal muscles and diaphragm instead of the muscles in the upper chest and neck ( when we spend long periods of time in stress mode or computer work etc. and we hold the breath in the paper region of our body we can definitely attribute a stiff neck resulting from this action). This conditioning of the respiratory muscles results in improved efficiency of oxygen exchange with every breath by allowing more air exchange to occur in the lower lungs. It also reduces strain on the muscles of the neck and upper chest, allowing these muscles to relax. In short, deep breathing is more relaxing and efficient, allowing higher volumes of oxygen to reach the body’s cells and tissues. Beyond the practice of simple deep breathing, the ancient yogis described different types of rhythmic deep breathing techniques that can have differing effects on the mind and body. In fact, many studies document the beneficial effects of yogic breathing in treating depression, anxiety, PTSD (posttraumatic stress disorder), COPD (chronic destructive pulmonary disease), and asthma, aside from all the physiological benefits. There are also theories that support the notion that by slowing down and controlling the breath, we can improve our longevity. Place one hand on your belly, slowly relax your abdominal muscles, and inhale slowly through the nose, bringing air into the bottom of your lungs. You should feel your abdomen rise. This expands the lower parts of the lungs. Continue to inhale as your rib cage expands outward, and finally, the collar bones rise. At the peak of the inhalation, pause for a moment, then exhale gently from the top of your lungs to the bottom. 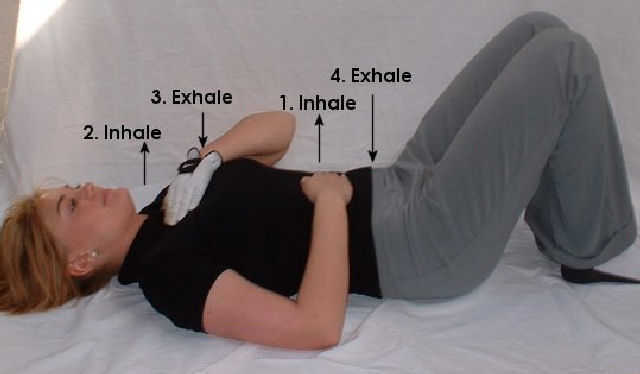 At the end of exhalation, contract your abdominal muscles slightly to push residual air out of the bottom of your lungs. When you are feeling anxious or ungrounded, practice Alternate Nostril Breathing, known as Nadi Shodhana in the yogic tradition. This will immediately help you feel calmer. When you feel angry, irritated, or frustrated, try a cooling pranayama such as Ocean’s Breath, or Ujjayi (pronounced oo-jai). This will immediately soothe and settle your mind. When you are feeling blue or sluggish, try Energizing Breath or Bhastrika. 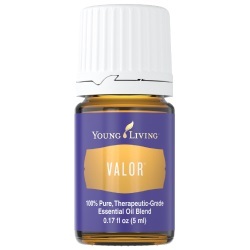 This will give you an immediate surge of energy and invigorate your mind. Although Bhastrika is a safe practice, stay tuned in to your body during the process. If you feel light-headed or very uncomfortable, stop for a few moments before resuming in a less intense manner. A regular daily practice of deep breathing is one of the best tools for improving your health and well-being. Performing one of these breath techniques twice daily for only three to five minutes can produce long-term benefits. You can also use them any time you are feeling stressed or notice that your breathing has become constricted. By training your body with a regular practice of deep breathing, you will begin to breathe more effectively even without concentrating on it. Brown, RP, et al. 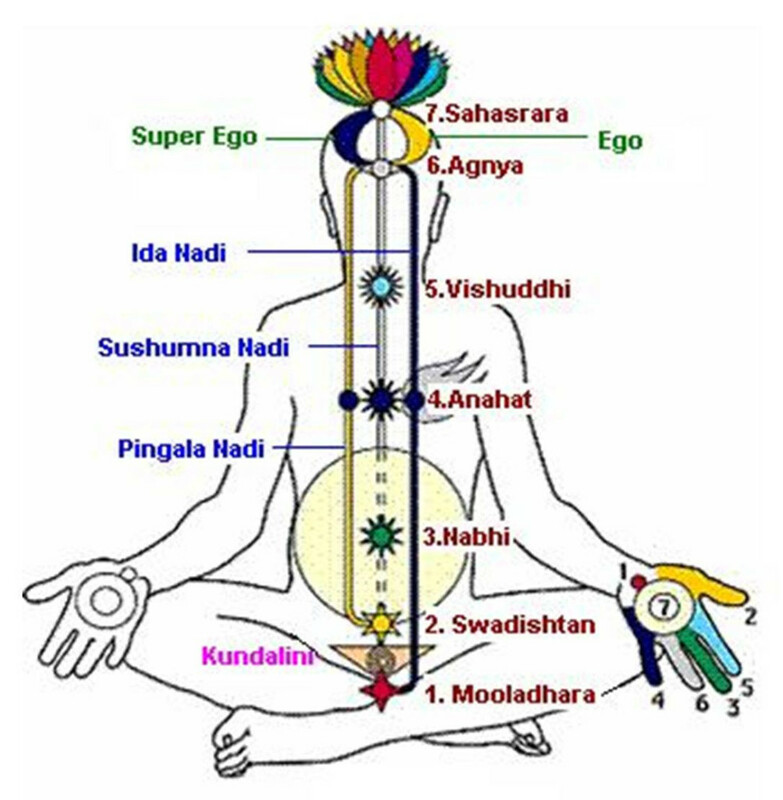 Sudarshan Kriya yogic breathing in the treatment of stress, anxiety, and depression: part 1-neurophysiologic model. J Altern Complement Med 2005 Apr;11(2):383-4. Harvard Medical School. Harvard Health Publications. Stress Management: Approaches for preventing and reducing stress. May 2009. Brown, RP, et al. Yoga breathing, meditation, and longevity. Ann N Y Acad Sci 2009 Aug 1172:54-62. Katiyar, SK, et al. 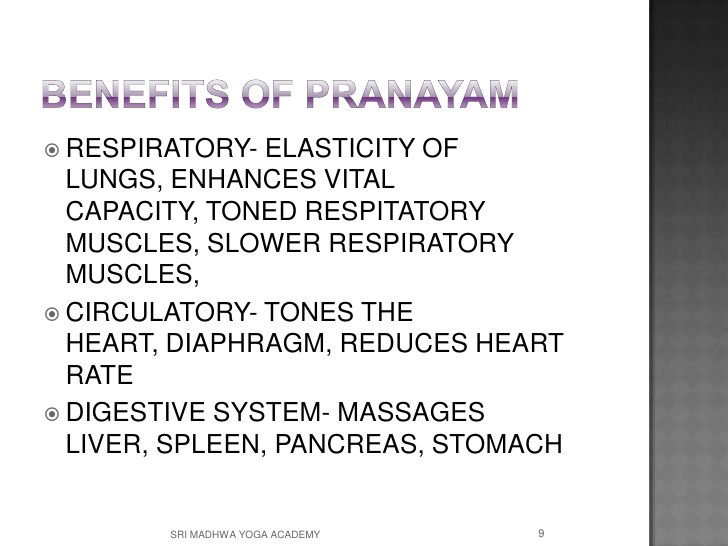 Role of Pranayama in Rehabilitation of COPD patients—a Randomized Controlled Study. Indian J Allergy Asthma Immunol 2006;20(2):98-104. Seppala, EM, et al. Breathing-based meditation decreases posttraumatic stress disorder symptoms in US military veterans: a randomized controlled longitudinal study. J Trauma Stress. 2014 Aug;27(4):397-405. Since breathing is something we can control and regulate, it is a useful tool for achieving a relaxed and clear state of mind. 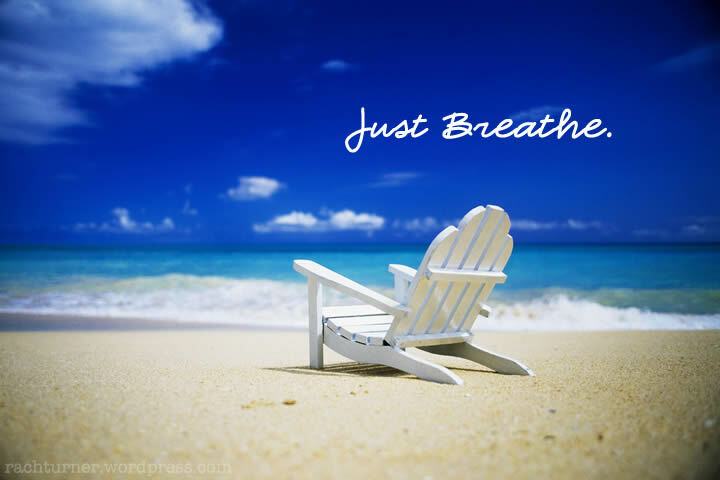 I recommend three breathing exercises to help relax and reduce stress: The Stimulating Breath, The 4-7-8 Breathing Exercise (also called the Relaxing Breath), and Breath Counting. Try each of these breathing teachniques and see how they affect your stress and anxiety levels. The Stimulating Breath is adapted from yogic breathing techniques. Its aim is to raise vital energy and increase alertness. If done properly, you may feel invigorated, comparable to the heightened awareness you feel after a good workout. You should feel the effort at the back of the neck, the diaphragm, the chest and the abdomen. Try this diaphragmatic breathing exercise the next time you need an energy boost and feel yourself reaching for a cup of coffee. 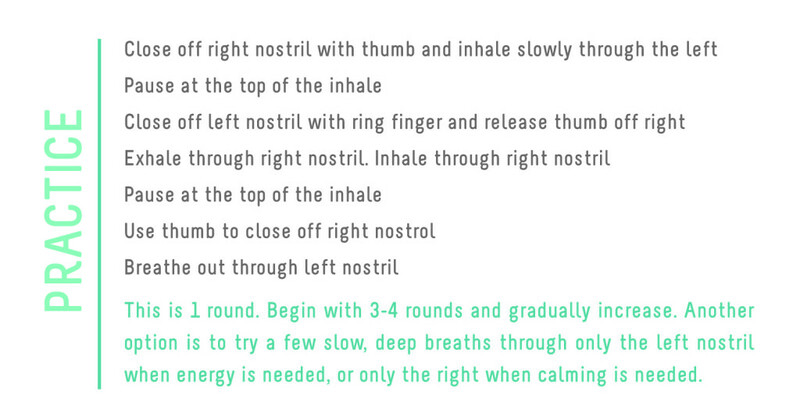 This breathing exercise is utterly simple, takes almost no time, requires no equipment and can be done anywhere. Although you can do the exercise in any position, sit with your back straight while learning the exercise. Place the tip of your tongue against the ridge of tissue just behind your upper front teeth, and keep it there through the entire exercise. You will be exhaling through your mouth around your tongue; try pursing your lips slightly if this seems awkward. Exhale completely through your mouth, making a whoosh sound to a count ofeight. Dare to be different in this prAna® Roxanne Printed Legging. Fitted legging is snug to the body and form fitting. Stretch fabrication extends, expands and contracts to move with you allowing for ultimate flexibility during any sport, activity or movement. 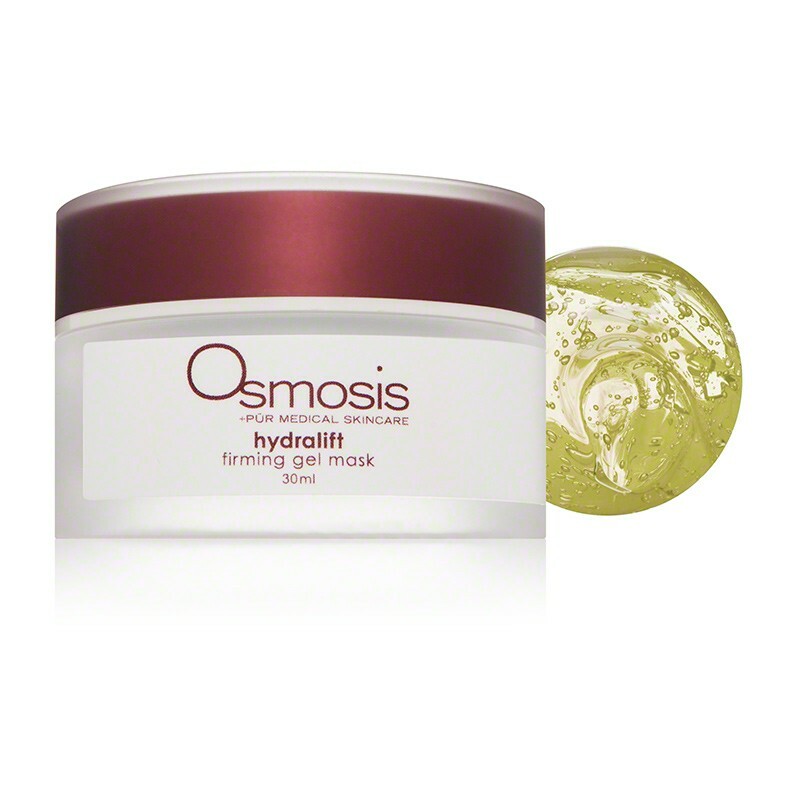 Quick-drying properties make sure moisture doesn’t linger for too long. 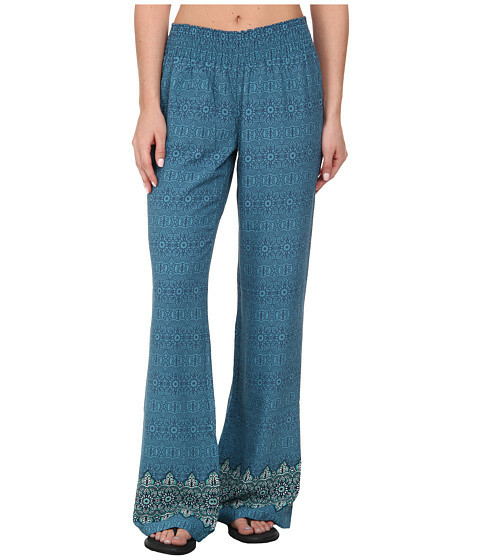 Let your free spirited side show when you adorn these boho chic Isadora Pants,Relaxed fit pant offers a mid rise with a full leg. On week 257 Happy Valentine’s Day to the world!!!! !, we wish you all the LOVE that you deserve. Enjoy the day and fell the love for everything around you, let your sense of love and joy expand to everything including the universe. We thank you again for the support, the likes, and shares. We are very grateful for them. When I think of any celebrations I am always curious about the customs of people all over the world, so for that reason, we did this post in honor of many cultures. 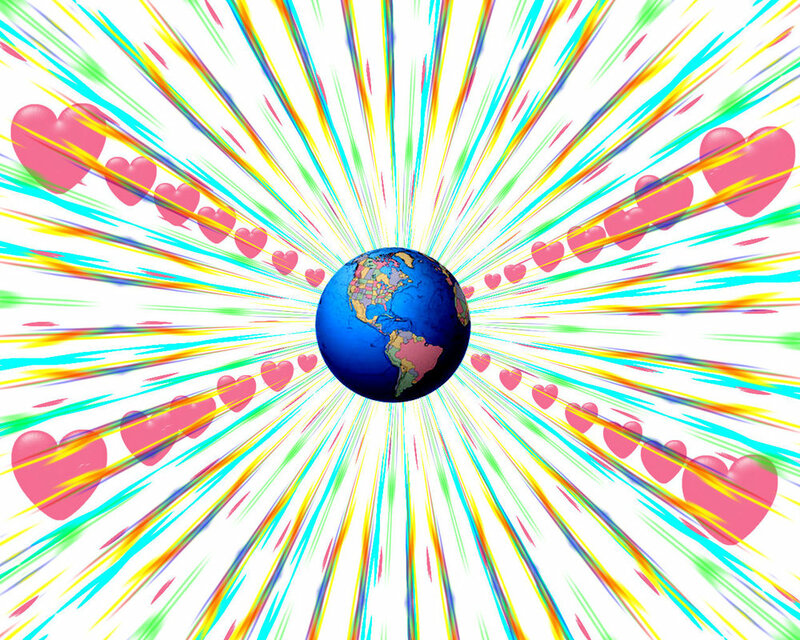 We would like to include every culture of the world, but for obvious reasons it is not a true possibility due to the fact that not all cultures celebrate Valentines day for one, and the other reason we discover along the years of sharing posts is that peoples attention span is short, so we decide to keep the posts to a certain length, so if we skip your culture celebration please contact us through email and we will be glad add it, it feels right. Many people have commented in how much they have learned in past years about different traditions and many are mixing theirs with the new information of other cultures and now they have a whole different unique way to celebrate their Valentine day.We love it being the fact that it should be unique, that’s what love is about. We all have different perceptions and needs, that is why we are INDIVIDUALS, right? 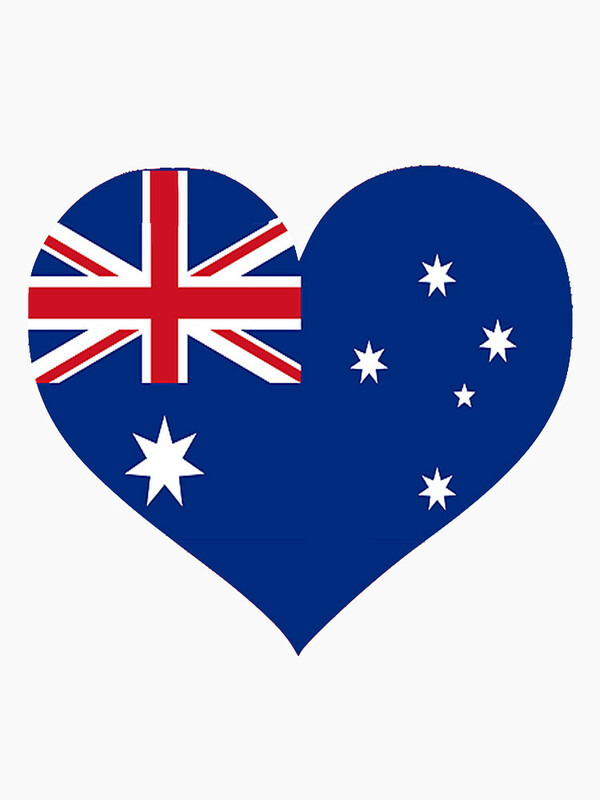 Anyway, we love to share these different cultures and their celebrations with you, and please share and like if you do. When we look at the history of Valentine’s Day we see is obscure, and further clouded by various fanciful legends. Research shows that the holiday’s roots are in the ancient Roman festival of Lupercalia, a fertility celebration commemorated annually on February 15. Pope Gelasius I recast this pagan festival as a Christian feast day circa 496, declaring February 14 to be St. Valentine’s Day. Most scholars believe that the St. Valentine of the holiday was a priest who attracted the disfavor of Roman emperor Claudius II around 270. And at this stage, the facts ends and the mythic begins. So according to one legend, Claudius II had prohibited marriage for young men, claiming that bachelors made better soldiers, how about that for control! Valentine continued to secretly perform marriage ceremonies but was eventually apprehended by the Romans and put to death. Another legend has it that Valentine, imprisoned by Claudius, fell in love with the daughter of his jailer. And before he was executed, he allegedly sent her a letter signed “from your Valentine.” Probably the most plausible story surrounding St. Valentine is one not focused on Eros (passionate love) but on agape (Christian love): he was martyred for refusing to renounce his religion. In the year 1969, the Catholic Church revised its liturgical calendar, removing the feast days of saints whose historical origins were questionable. St. Valentine was one of the casualties and that is one of many stores about St. Valentine that we came across. Valentines Day festival gained much popularity during the Middle Ages.It is said that lovers began to celebrate the day by exchanging love notes and simple gifts such as flowers. The idea of linking Valentine’s Day with love in Middle Ages was strengthened by the notion that birds began to look for a mate during this time interesting comparison wouldn’t you say?. Various legends related to the festival including that of Feast of Lupercalia and martyrdom of Saint Valentine further lead to the increase in the popularity of Valentine’s Day festival. And, cousin mine, upon Monday is Saint Valentine’s Day and every bird chooses himself a mate, and if it like you to come on Thursday night and make provision that you may abide till then, I trust to God that ye shall speak to my husband and I shall pray that we may bring the matter to a conclusion. These popular verses further helped to create a romantic image of Valentine’s Day festival during the Middle Ages. Lovers, therefore, began to celebrate Valentine’s Day by expressing love to their sweethearts with an exchange of love notes and simple gifts such as flowers and the gifts of the heart. The first known Valentine card is said to have been written in 1415 by Charles, Duke of Orleans to his wife while he was imprisoned in the Tower of London following his capture at the Battle of Agincourt. The greeting is part of the manuscript collection of the British Library in London, England. Historians also say that Saint Valentine of Rome also sent a letter signed “From your Valentine”, to his sweetheart who was the jailer’s daughter a day before he was to be executed. This phrase is still popular amongst lovers and it continues to live through the centuries. One very popular legend of Valentine’s Day states that the festival originated from the Feast of Lupercalia – a fertility festival celebrated in mid-February by ancient Roman during pagan times. The festival paired young boys and girls through a lottery system who would fall in love and marry. Another legend states that a priest called St Valentine lived in Rome during the reign of Emperor Claudius II. Valentine defied the orders of Claudius order that banned engagements and marriages in Rome and secretly married young boys and girls. Saint Valentine was executed by Claudius on February 14, 498 AD. Over the period of time, St Valentine became the patron saint of lovers and they began to celebrate his martyrdom by expressing love for their beloved and exchanging love notes, so many legends. While Cupid is not believed to be a real person, Cupid was the cherub of Love to ancient Romans, and many Italians believed in his powers. Even in the modern world, references to Cupid and his bow and arrows of love are found everywhere on Valentine’s Day’s cards, candy, pastries and much more. 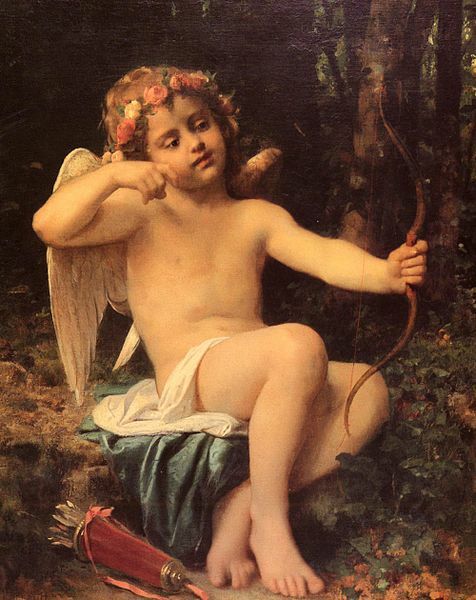 Cupid was not initially the cherubic, happy little angel that we think of today. In his original incarnation, he was a very mischievous, sometimes dark cherub of love and desire who enjoyed matching ‘odd couples’ and seeing how they worked out. Cupid eventually fell under his own spell of odd matches. He fell in love with Psyche, a mortal. In the Greek language, Psyche means “butterfly” and also means “soul”. In many ways, what Psyche goes through is symbolic of the path of each woman’s soul in life. Cupid had actually been sent by his mother, Venus, to punish Psyche for her beauty. Instead, he was captivated by her and fell deeply in love. He will arrange to have her brought to his mountain home to live with him, but he hid his identity from her, and only visit her at night. Their time together was so tender and full of gentle talk and loving moments that Psyche fell in love with Cupid. Psyche’s jealous sisters were angered by her wealth and love and convinced Psyche that her lover must be a bad person to so hide. The sisters persuaded her to sneak up on him after he left her one evening, armed with a knife. He awoke and saw her there, and said sadly, “I inflict no other punishment on you than to leave you forever. Love cannot dwell with suspicion.”Wow that is so true love never lives were is suspicion, doubt or nay kind of negative feelings that contradict the concept of love, good lesson. Psyche realized how foolish she’d been, and decided the only way to be with Cupid again was to go talk to Venus and ask for her blessing. Venus was delighted at having Psyche kneeling down before her, and set forth many tasks for Psyche to perform to prove her worthiness, Humm! that’s one way to get things done. Each task was more than Psyche thought she could manage, but in each case, a God stepped in to assist her. Finally, Psyche and Cupid were allowed to be married. They were very happy together, and had a child, named Pleasure., what a heart felt story. It is saidDuring the Australian gold rush period, miners who were suddenly in possession of money from the new-found wealth of the Ballarat Mines were willing to pay a princely sum for elaborate valentines and merchants in the country would ship orders amounting to thousands of pounds at a time. The most extravagant Australian valentines were made of a satin cushion, perfumed and decorated in an ornate manner with flowers and colored shells. Some might even be adorned with a taxidermied hummingbird or bird of paradise. This treasure, contained within a neatly decorated box, was highly valued, being both fashionable and extremely expensive. Austria celebrates Valentine’s Day in the way any other developed country enjoys it. The American influence on Austrian culture is profound and it’s believed that Americans introduced the whole concept of Valentine’s Day to Austria. Austria is famous for the dance to waltz and hotels offer three nights from Valentine’s Day in Vienna with a fairytale ball thrown in. The fun will take place in a beautiful Italian renaissance building in Vienna’s Stadtpark named `Wiener Kursalon’, with holidaymakers dancing to famous waltzes of Johann Strauss’ along with popular opera as well as modern pop music. Austria follows the popular customary rituals of Valentine’s Day such as greeting cards, flower bouquets, and gift baskets. It has become a tradition in Austria for a young man to present his loved one with a bunch of red flowers on Valentine’s Day. Red flowers are considered as the symbol of love from the ancient times. It still rules the valentine minds in Austria as it does in another part of the world. Lovers exchange flower bouquets on Valentine’s Day in Austria. Red roses and red tulips are the most favorite flowers which make the most valentines’ flower bouquets on Valentine’s Day. As flowers, chocolate candies draw smiles on Austrian sweethearts’ faces. Austrian women give chocolate candies as Valentine’s gifts. People prefer homemade chocolate cookies than the ones which they can purchase from the stores. Austria being a land of music, where Beethoven and Mozart breathed music, has a lot of musical concerts takes place on Valentine’s Day. Musicians of different bands and of different genre come to Vienna, the capital city of Austria to play the music of love on that day. Restaurants in Austria offer romantic valentine dinner arrangements on the day. These restaurants get decorated to make them look slicker for lovers. They offer delicious and exotic food menu on the day. Austrian food is almost a mixture of Bohemian, Hungarian and Austrian dishes, like goulash, different kinds of veal and beef and sweet dessert. This helps the lovers to enjoy Valentine’s evening with soft romantic music and nice food. When a lot of people are using the traditional gift methods of Valentine’s Day while Austrian youngsters use email, SMS, and E-cards to send their love messages. Austrian nightlife is rocking with umpteen number of beer pubs welcoming lovers on Valentine’s Day. It is an exotic experience to celebrate Valentine’s day in Austria. Austria has some rather obscure courtship customs that may or may not be associated with Saint Valentine’s Day. Nonetheless, it is customary for a young man to present his beloved with a bunch of flowers on February 14. Bohemian, Hungarian and Austrian dishes, like goulash, different kinds of veal and beef and sweet dessert. This helps the lovers to enjoy Valentine’s evening with soft romantic music and nice food. When a lot of people are using the traditional gift methods of Valentine’s Day while Austrian youngsters use email, SMS, and E-cards to send their love messages. Austrian nightlife is rocking with umpteen number of beer pubs welcoming lovers on Valentine’s Day. 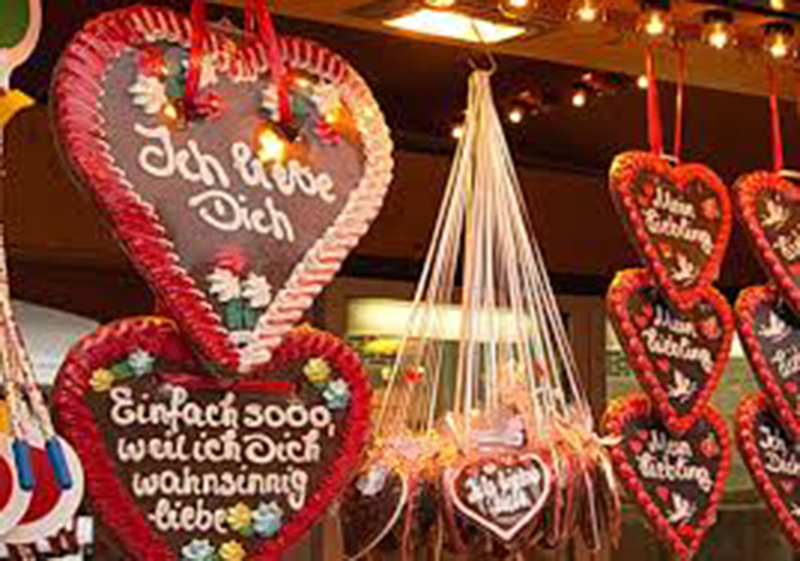 It is an exotic experience to celebrate Valentine’s day in Austria. In the United States of America, there have been so many varieties of cards given over the course of the years. In the times of the Civil War, cards were flagged with rich colors accompanied by patriotic political motifs. Early American valentine cards were especially lithographed and hand-colored, beautiful and very distinctive in design, they were produced with intricate lace paper and decorated with such ornaments as beads, sea shells, cones, berries twigs and all manner of seeds. Cards were also available decorated with seaweed or moss, in addition to dried artificial flowers, all of which were attached to a string which was pulled and could then be suspended, thereby creating a three-dimensional picture. For the most part many early American cards were imported from abroad, given the poor quality of American paper at the time which was not particularly suitable for embossing. In the United States and Canada, Valentine’s Day is an extremely popular festival. Here, the day is observed as a holiday. Originally held to honor St Valentine and express love to sweethearts, the theme of the day has come to be so widened that it has now become an occasion to express gratitude and love to not only sweethearts and spouses, but also to teachers, parents or any other close relation or acquaintance. 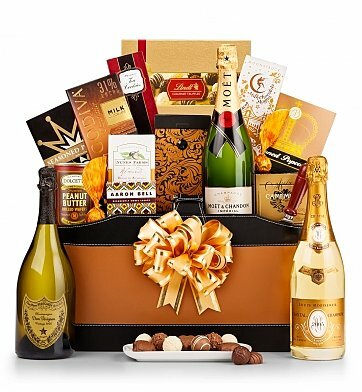 The modern celebrations of the day see people complementing their dear ones with gifts that include popular items as cards, fresh flowers like rose, chocolates and candies jewelry and much more. Dinner and dance parties are specially organized all over the country to celebrate the occasion. Many couples hold private celebrations in homes or restaurants and gift flowers, a box of candy, or some other present to one another. Sending candies on Valentine’s Day has been a very popular tradition and it still is. In the US, children celebrate Valentine’s Day with great enthusiasm. To keep with their interest, many schools hold Valentine’s Day programs where little students perform songs, dance, skits and plays. Kids handcraft gifts and cards on this occasion and present them to their friends and teachers. In some schools, the children organize a classroom party and put all the valentines into a box they have decorated. In dos cases, the celebration culminates with a teacher or child distributing the cards. Older students construct candy baskets and gifts, and place on them cards trimmed with hearts, cherubs winged children called cupids. They also organize dances and parties. A collective endeavor is made to make the day a special one. 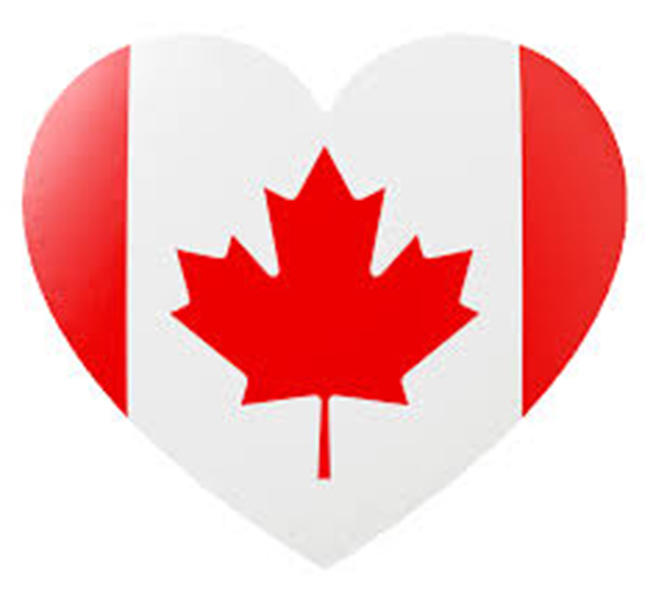 Valentines Day festival is celebrated with much enthusiasm in Canada. Valentine’s Day balls and parties are organized all over the country where people express love for their spouses and sweethearts and enjoy to the hilt. Roses, chocolates, candies and cards are the most popular gifts for the romantic occasion. As a tradition, children in Canada exchange Valentine’s Day gifts with their friends. In several schools, classroom Valentine’s Day Parties are organized where children put all the valentines in a decorated box. Later, teacher or a child distributes the cards. Kids are encouraged to prepare handmade valentine as a school activity. Many children also gift fancy Valentines Day card to parents and teachers. Songs, skits, plays and concerts are also organized by schools and societies to celebrate Valentine’s Day. Students in senior school hold Valentine’s Day dance parties to cherish the joyful festival, how fun. The poets of Britain have probably penned the majority of the best-loved romantic verses that are associated with Saint Valentine. Different regions of the nation celebrate their own customs to honor this day, although the sending of cards and gifts of flowers and chocolates is, for the most part, the standard procedure throughout the entire country. One uniform custom is the singing of special songs by children, who then receive gifts of candy, fruit or money. In some areas, valentine buns are baked with caraway seeds, plums or raisins. In Britain, St Valentine’s Day is celebrated with great fanfare and gaiety. Like in many other countries, the common celebrations of the day have people expressing love for their beloved with gifts like flowers, cards, chocolates and so many more special items. The traditions of the celebrations of Valentine’s Day differs in different regions of the country but one uniform custom is the singing of special songs by children. All over Britain, children sing special songs related to the occasion and are rewarded with gifts like candy, fruit or money. Another popular tradition followed in some areas of England is the baking of valentine buns with caraway seeds, plums, or raisins. This is believed to be a way of celebrating agrarian productivity. This connection with fertility and the similar date of celebration are probably the reasons why many writers link the festival of Lupercalia with Valentine’s Day. Composing verses is another very well-known Valentine’s Day custom of Britain. About a month earlier to Valentine’s Day, leading tabloids and reputed magazines publish sonnets and verses to commemorate this occasion. The tradition owes its origin to the British poets who have penned some of the best love poems and the majority of the romantic verses associated with Saint Valentine. The Danish valentine card is known as a “lover’s card.” Older versions of this greeting came in the form of a transparency which, when held up to the light, depicted the image of a lover handing his beloved a gift and still you can find it. One custom in Denmark is for people to send pressed white flowers called Snowdrops to their friends. Danish men may also send a form of valentine known as a gaekkebrev (or “joking letter”) leave it up yo guys right?. The sender of this gaekkebrev pens a rhyme but does not sign his name. Instead, he signs the message with dots…one dot for each letter in his name. If the lady who receives the card guesses the name of the sender, then she is rewarded with an Easter Egg later in the year, pretty playful I love it. In Denmark, February 14 is mainly a day for the young. It’s a time for romance and exchanging of love tokens. Here, the festival is celebrated in a very conventional manner. Young people send to their beloveds a valentine card on this occasion. 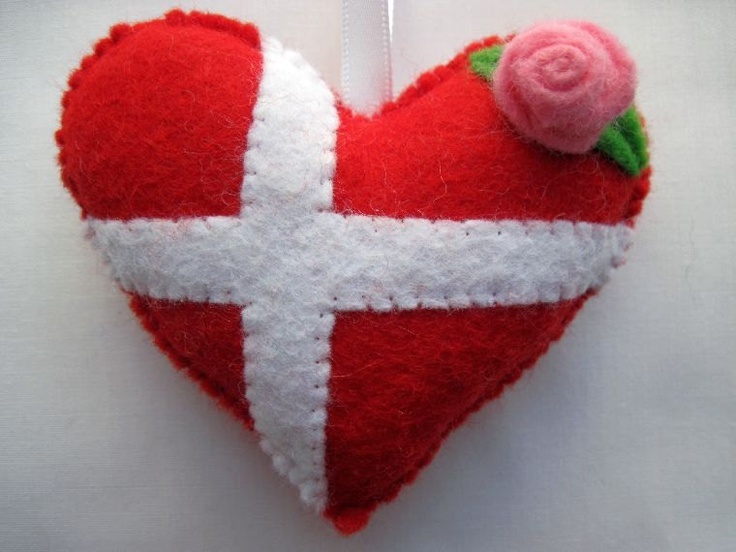 The Danish valentine card is famously known as a “lover’s card”. Earlier, these came in the form of transparent cards which, when kept before light, reflected the picture of a lover handing over a wonderful present to his beloved. Nowadays, many newer varieties of lover’s cards have come up and every year before Valentine’s Day card shops all across the country are seen to be stacked up with colorful and musical lover’s cards containing lovely Valentine messages. Another Danish Valentine’s Day custom is to send pressed white flowers called Snowdrops to friends. The season of love is also a time for fun what with many Danish men sending to their ladylove a form of valentine known as a gaekkebrev (or “joking letter”). This gaekkebrev is a type of romantic letter that contains a rhyme penned by the sender himself. The fun part of this custom is that the letter doesn’t have the name of the sender. Instead, the lover signs the message with dots…one dot for each letter in his name. If the lady whom he sends the gaekkebrev correctly guesses his name, he rewards her with an Easter egg during Eastertide. In France, a custom known as “drawing for” once occurred. Unmarried individuals, both young and not so young, would go into houses facing each other and begin calling out across from one window to another, pairing-off with the chosen partner. If the young man failed to be particularly enthralled with his valentine, he would desert her. As a result, a bonfire would be lit later where the ladies could burn images of the ungrateful sweetheart and verbally abuse him in a loud tone as the effigy burned. This ritual was eventually abandoned since it left much room for nastiness, ridicule or even outright malice and the French government finally handed-down a decree officially banning the custom. Elegant French greetings cards known as cartes d’amities, which contained tender messages, were given not totally as a Valentine but chiefly as a result of a fashion which was popular in England at the time. 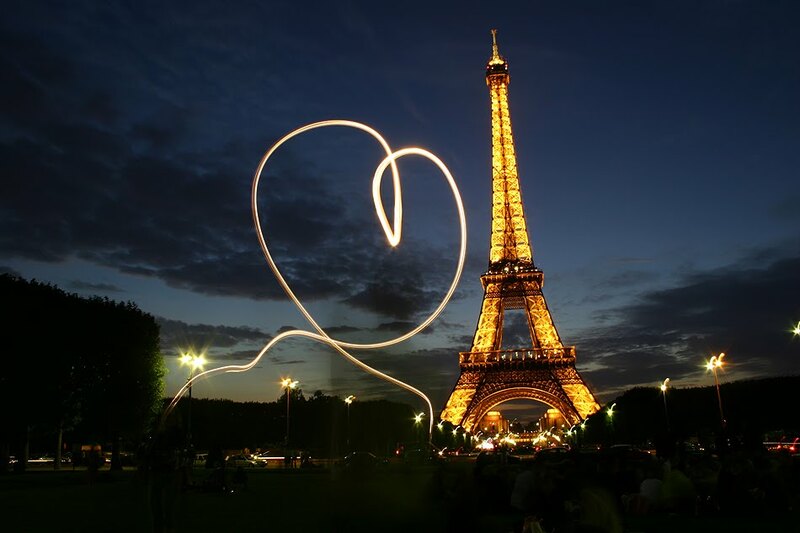 Valentine’s Day Festival is celebrated with joy and enthusiasm in France. People take the opportunity of the occasion and express love to people close to them. Just as in several other countries people in France exchange Valentine’s Day greetings through cards, fresh flowers, and gifts of love. History of Valentine’s Day Festival has a strong association with France. It is said that during the Middle Ages, there was a popular belief in France and England that birds began to mate halfway through the second month of the year. For this reason, lovers saw the day special and considered it auspicious to exchange love letters and tokens of love on Valentine’s Day. During fourteenth and fifteenth centuries, French and English poets and litterateurs too stressed on this idea and created a romantic image of the day in the minds of the people. Valentine’s Day Cards too are said to have originated in France. A young Frenchman, Charles, Duke of Orleans is said to have written the first written Valentine’s Day Cards. The Duke who was captured at the Battle of Agincourt in 1415 is said to have written a poem or ‘Valentine’ to his wife while imprisonment in the Tower of London. People in France once followed a peculiar Valentine’s Day custom called “drawing for”. 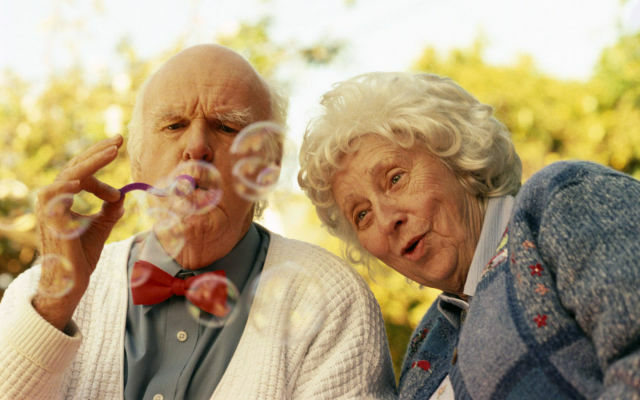 Unmarried young and old people would go into houses facing each other and begin calling out across from one window to another and pair off with their chosen partner. If the young man failed to be particularly enthralled with his valentine, he would desert her. A bonfire would be lit later where ladies would burn images of their ungrateful lovers and hurl abuses at them. The ritual was eventually abandoned as it left much room for nastiness and ridicule. French government handed down a decree and officially banned the custom. There was also a custom in France to exchange elegant cards containing tender messages called cartes d’amities. These were not essentially Valentine and resulted chiefly due to a trend popular in England. In Germany, it has become customary for the young man of a courting couple to present his beloved with flowers on February 14. Valentine gifts in Germany are usually in the shape of love tokens, complete with endearing messages. However, these are not distributed solely on Valentine’s Day, but on any occasion. Even early German baptismal certificates or marriage certificates were considered at one time to have been valentines but were more likely simply decorative and pictorial documents which contained lovely verses. The German celebration of Valentine’s Day is nearly the same as elsewhere in the world. For Germans, the festival is a celebration of love and a time to spend with their sweethearts. In Germany, it is customary for a young man to present his beloved with flowers on February 14. Valentine gifts in Germany are usually in the shape of love tokens, complete with lovely messages. But these are not entirely restricted to Valentine’s Day celebrations and can be gifted on any occasion of a joyous nature. 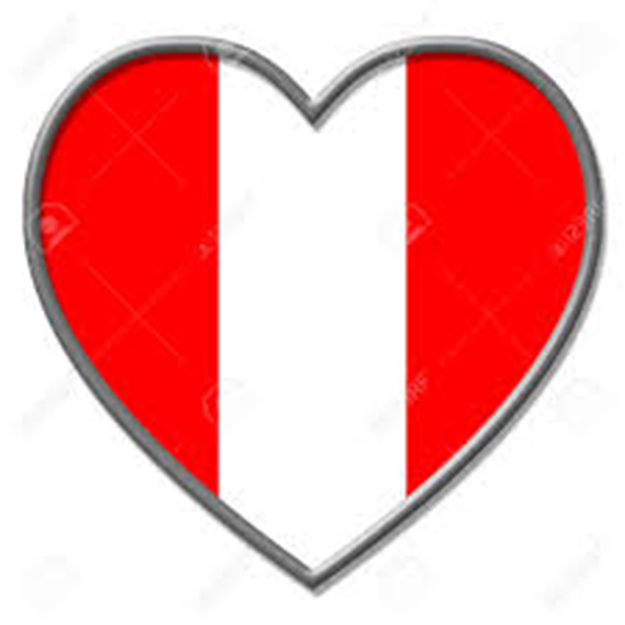 In Italy, Valentine’s Day was once celebrated as a Spring Festival, held in the open air, where young people would gather in tree arbors or ornamental gardens to listen to music and the reading of poetry. However, over the course of the years, this custom steadily ceased and has not now been celebrated for centuries. In Turin, it was formerly the custom for betrothed couples to announce their engagements on February 14. For several days ahead of time, the stores would be decorated and filled with all manner of bon-bons. 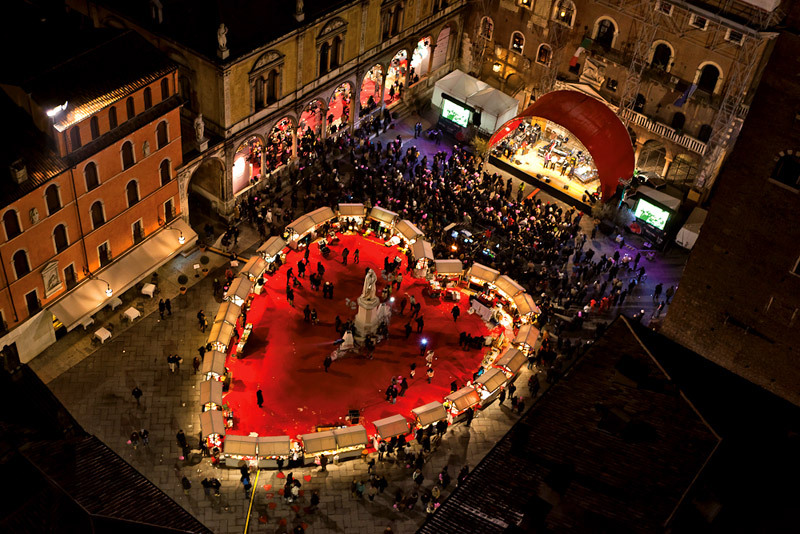 Romantic Festival of Valentine’s Day is celebrated with enthusiasm in the beautiful country of Italy. Lovers take the opportunity of the day to express love and affection for their beloved. Loads of Valentine’s Day gifts are exchanged and everyone enjoys the day to the hilt. Valentine’s Day was initially celebrated as a Spring Festival in Italy. Celebration of the day was held in the open air. Young people would gather in tree arbors or ornamental gardens and enjoy listening to music and reading of poetry. Later they would stroll off with their Valentine into the gardens. The custom steadily ceased over the course of years and has not been celebrated for centuries. In the Italian City of Turin, betrothed couple used to announce their engagement on the Valentine’s Day. Several days ahead of February 14, stores were decorated and loaded with a huge variety of bon-bon. Some even sold china baskets and cups filled with delectable Valentine’s Day candies and tied with a ribbon. These were to be presented as gifts to Valentine. Another interesting Valentine’s Day tradition followed in Italy and Britain made unmarried girls wake up before sunrise. People strongly believed that the first man an unmarried girl sees on Valentine’s Day, or someone who looks like him would marry her within a year. Girls, therefore, used to wake up early on Valentine’s Day and stand by their window to watch a man pass. People of Italy see Valentine’s Day as a holiday imported from the US, just like Halloween and Mother’s Day. For the love and lovers country of Italy, the major day for the celebration of love is il giorno della festa degli innamorati. As lovers’ exclusively celebrate this day family members and friends do not exchange gifts. In recent times, however, lovers in Italy celebrate Valentine’s Day by expressing their love to sweethearts. Couples usually go out for dinners at pizzeria or ristorante. Just as in several other countries, the festival has been commercialized to a great extent. There is a strong tradition to exchange gifts like a rose, perfume, chocolates and diamonds depending on the age and taste of the person. Another popular Valentine’s Day gift in Italy is Baci Perugina – a small, chocolate-covered hazelnuts containing a small slip of paper with a romantic poetic quote in four languages. In Italy, Valentine’s Day was once celebrated as a Spring Festival. It used to be held in the open air, where young people would gather in brightly decorated gardens to listen to music and the reading of poetry. This custom, however, steadily ceased with the passage of time, and has been out of practice for a long long time. In modern day Italy, Valentine’s Day is mainly seen as a holiday imported from the US, just like Halloween, Father’s Day or Mother’s Day. The day is celebrated mainly by the young people who take this opportunity to profess love to their sweethearts the American way with gifts like perfume, chocolates, flowers, cards or jewellery. The day is seen here earmarked exclusively for lovers, and hence, family members and friends do not exchange gifts. Couples usually go out for dinners at pizzeria or ristorante which ends with lovers’ giving gifts to each other. A popular Valentine’s Day gift in Italy is Baci Perugina – a small, chocolate-covered hazelnut containing a small slip of paper with a romantic poetic quote in four languages. In Japan, Valentine’s Day is celebrated on two different dates…February 14 and March 14. On the first date, the female gives a gift to the male and on the second date…known as White Day and supposedly introduced by a marshmallow company in the 1960s…the male has to return the gift he received on February 14. 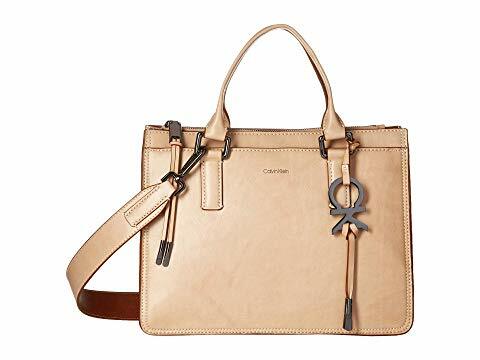 Thus, strictly speaking, a Japanese female has the luxury of actually choosing her own gift. Chocolate is the most popular gift in Japan. However, since most Japanese females believe that store-bought chocolate is not a gift of true love, they tend to make the confection with their own hands. In Japan, Valentine’s Day is observed on February 14 but the celebration of love truly ends on March 14, known as the “White Day”. On the first date, women present chocolates or gifts to the men they love to express their feelings for them. Gifting chocolates is a typical way to celebrate Valentine’s day in Japan for chocolate is the most popular gift in the country. Hence, it is a must for Japanese Valentine’s Day celebrations. 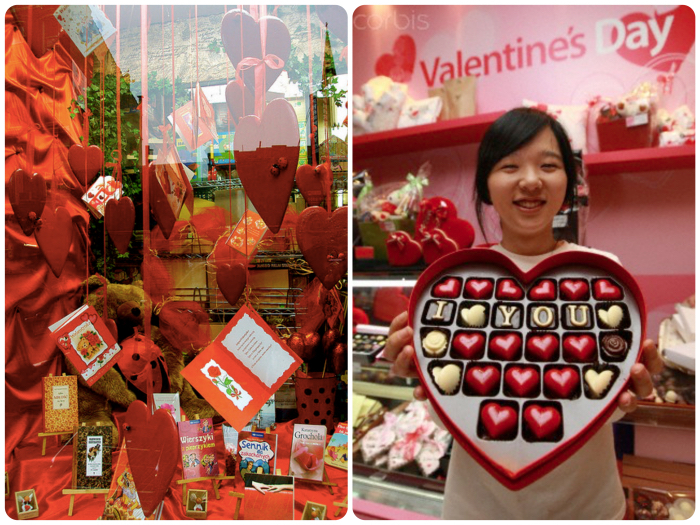 Gift shops all over Japan pile their shelves with chocolate a month before Valentine’s Day. Most Japanese females believe, however, that store-bought chocolate is not a gift of true love. Hence, they tend to make the confection all by themselves. But it’s also common for women to give chocolates to any man close to them, such as co-workers and male friends, whom they don’t actually love. This kind of chocolate gift is called giri-choco which mean chocolates given because of obligations. Men who receive chocolates or gifts on Valentine’s day are supposed to return the favour to the women on March 14, exactly a month after Valentine’s Day. Also known as “White Day”, this is the time when men are to give back a gift to the women who gave them gifts just a month before. The tradition is believed to have been introduced by a marshmallow company in the 1960s. The traditional gift of candy takes place in Korea on February 14, but only from females to males. There is another special day for males to give gifts to females and this is celebrated on March 14. Very similar to the custom in Japan, March 14 in Korea is known as “White Day.” On “White Day,” many young men confess their love for the first time to their sweethearts. For those young people who have no particular romantic partners, the Koreans have set aside yet another date…April 14, also known as “Black Day.” On that date, such individuals get together and partake of Jajang noodles, which are black in color, hence the name of the day. The Valentine’s Day celebrations in Korea is quite akin to the Japanese observance of the festival. As in Japan, Korea witnesses gifting of chocolates and candies from females to males. The favour is returned the same way by the men on March 14, which is referred to as “White Day” similar to the custom in Japan. But “White Day” here is Valentine’s day in its own right as many young men confess their love for the first time to their sweethearts on this occasion. And then there is April 14, also known as “Black Day”, which has been specially set aside for those young people who have no particular romantic partners. The curious name of the day probably comes from the fact that on this date, individuals who are not in any relationship get together and partake of Jajang noodles, which are black in color. 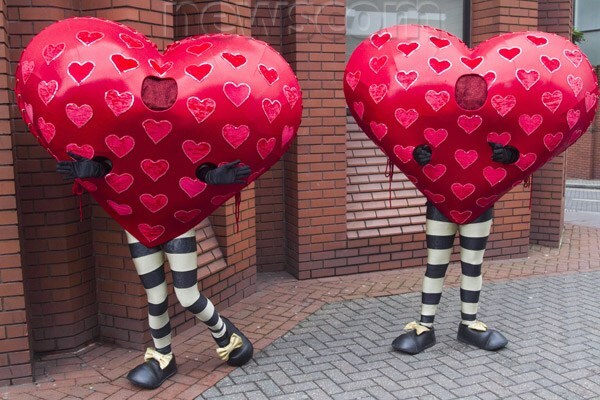 In Scotland, Valentine’s Day is celebrated with a festival. At this festival, there is an equal number of unmarried males and females, each of whom writes their name (or a made-up name) on a piece of paper which is then folded and placed into a hat…one hat for the ladies and one for the men. The females then draw a name from the hat containing the men’s names and vice versa. Of course, it is highly likely that the two drawn names will not match, in which event, it is usually expected that the male partner with the female who selected his name. This rite having been completed, the company split up into couples and gifts are given to the ladies. The females would then pin the name of their partner over their hearts or on their sleeves. A dance often follows and, at the end of the festival, it is not unusual for marriages to take place. According to another Scottish custom, the first young man or woman encountered by chance on the street or elsewhere will become that individual’s valentine. Valentine’s Day gifts in Scotland are frequently given by both parties in the form of a love-token or true-love-knot. In Spain, it is customary for courting couples to exchange gifts on Valentine’s Day and for husbands to send their wives bouquets of roses. Although not a traditional Spanish holiday, St. Valentine’s Day in Spain is celebrated, like in most of the countries, with all kinds of sweet heart-shaped gifts, bouquets of flowers, cards and romantic dinners at fancy restaurants. Shop windows are decorated with hearts in all shades of red and pink, bars and cafes are getting creative with Valentine-themed offerings, and many events are organized throughout the country. However, what’s really interesting about St. Valentine’s Day in Spain is that certain regions have their own versions of the holiday, usually celebrated with great fanfare and peculiar traditions. 1. For people from Valencia, the most romantic day of the year is the 9th of October, when they celebrate both the Day of the Valencian Community as well as the Day of Saint Dionysius (Sant Dionís), locally known as the patron saint of lovers. This is a public holiday marked by many festivities and colorful costume parades held in the main plaza of every town and village. A distinctive tradition on the Day of Saint Dionysius is the custom of offering ladies a Mocadora (Mocaorà) as a sign of love and appreciation. This traditional gift consists of a nice package of marzipan figurines handcrafted by local confectioners and then wrapped up in an elegant piece of silk. 2. In Barcelona and the whole Catalonia, couples rejoice their love on April 23, when the nation celebrates St. George’s Day or La Diada de Sant Jordi – Catalonia’s national day. This public holiday is also known as El Dia de la Rosa (The Day of the Rose) or El Dia del Llibre (The Day of the Book) and the main event is the exchange of gifts, usually roses and books, hence the Catalan saying “A rose for love and a book forever”. As expected, during this time of year, a myriad of stalls selling roses and books are set up all over the region, public squares are brought to life by all sorts of performers and most of the book stores and cafes organize readings. Moreover, this is the day when Barcelona’s Palau de la Generalitat opens its doors to the public. 3. Convinced that this is a holiday invented to boost consumerism, Spaniards often refer to Valentine’s Day as the Día de El Corte Inglés (Day of Corte Inglés), their main department store. But Spain actually has another ‘lovers day’ that I think has a far better case for celebration. St. George’s Day, the same day that is celebrated not nearly enough in England even though it is our patron saint too. But as I said, Spain loves a saint, and they do it properly here. Many countries have Saint George as their patron saint and most celebrate it on April 23rd (the accepted date of Saint George’s death in 303 AD). In Catalonia it is called La Diada de Sant Jordi, also known as El Dia de Rosa (The Day of the Rose) or El Dia del Llibre (The Day of the Book) and is a public holiday. The main event is the exchange of gifts between loved ones. Roses have been associated with this day since medieval times but more recently the giving of books is the custom. This came about in the 20th century as some bright spark of a bookseller realized that Josep Pla (1897-1981), Miguel Cervantes(1547-1616) and William Shakespeare (1564-1616), all great proponents of the written word had all died on the same day, April 23rd. Again, far more valid a celebration in my opinion. So, please do celebrate Valentine’s Day if you so wish. I wouldn’t want to be the reason for any break-ups. But let’s make sure we celebrate St. Georges Day too. In my eyes a far more valid day for the celebration of love and literature. And it will make up for the poor job they did of it in England when I was growing up. In spite of all these modern celebrations of love, traditional Chinese love stories as far as my limited knowledge allows are rather grim. The love stories all end unhappily. An emperor falls for a mistress-spy from one of his conquered kingdoms, who costs him the empire. A fairy falls for a human and ends up forced to return to heaven alone. The one happy story was based on a real-life artist-poet who infiltrated a household so he could woo one of the daughters and make her his wife (in real life she was his ninth wife. )It is said that the abundance of sad stories is because people there love to cry at a good tragedy. Whether you’re in a cosy couple or single and free, I hope you had a lovely Valentine’s Day with lots of love. Valentine’s Day in South Africa is celebrated with great passion and enthusiasm. The day is celebrated on 14th February every year. The craze and verve for the festival is like any other festival in South Africa. The geographical location of the country has made it one of the most romantic destinations. Thousands of tourists get attracted towards the beauty of the place when it comes to celebrate the festival of love. 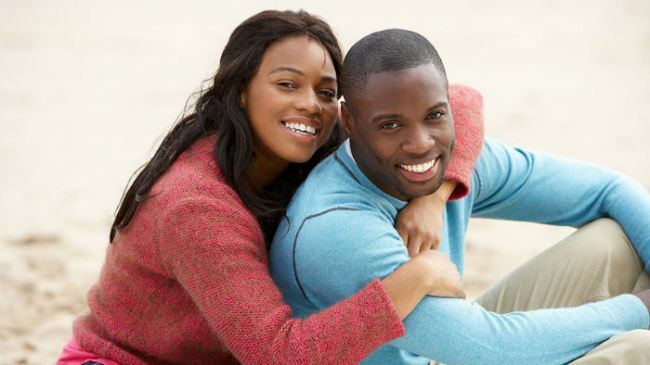 Large number of tourists throng the beaches and other romantic places of South Africa to celebrate Valentine’s day. Most commonly observed tradition includes going out on a romantic date with one’s Valentine. 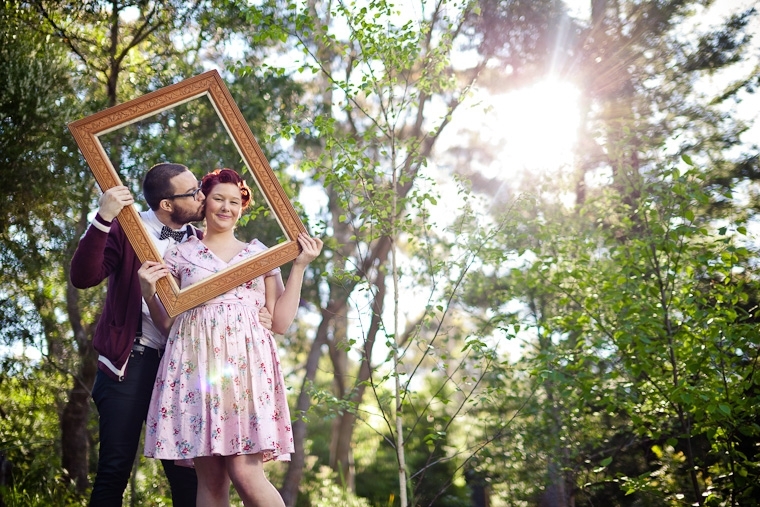 Young couples make it traditional to celebrate the day at a very romantic place. Also, young girls celebrate the occasion by following an old-age Roman festival of ‘Lupercalia’. According to this traditional festival, young girls pin their lovers name on their sleeves. At some places, men also follow this custom. Valentine’s Day celebrations begin well in advance in South Africa. Shops and market places are beautifully adorned with fragrant flowers, love symbols like cupid, love birds, hearts and in traditional African style decorations. Week long parties and celebrations take place in various clubs and hotels. These activities highlight the tradition and South African culture. 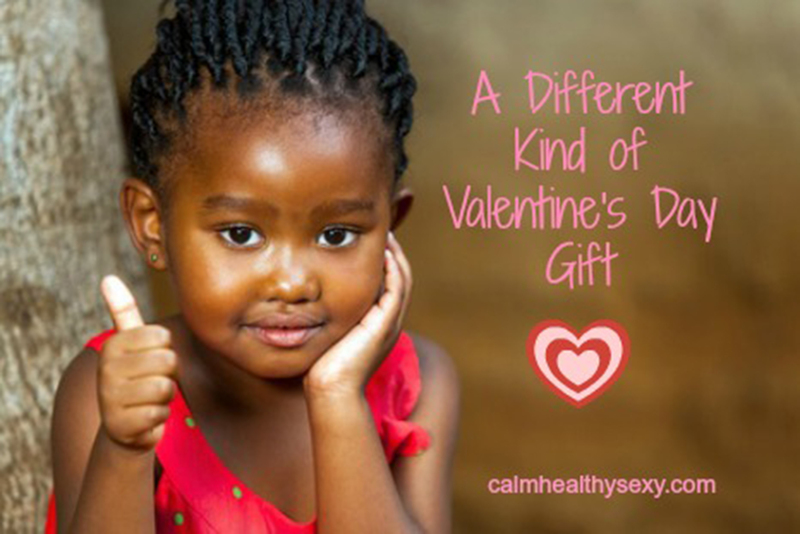 People totally indulge themselves in the African culture and art to celebrate the occasion of Valentine. 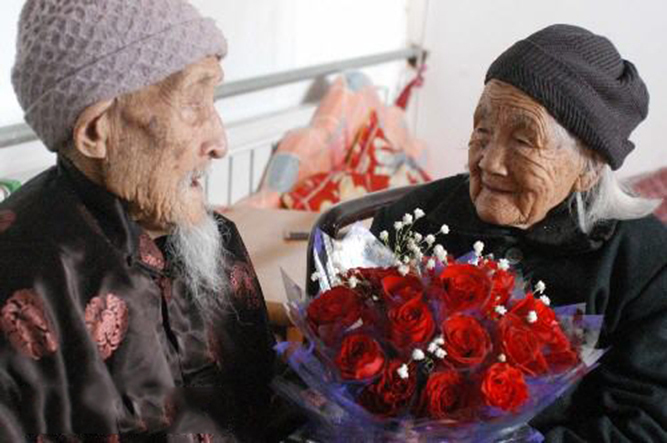 Be it an old man of 60 or a young lass of 16, the joy of celebrating love is same in everybody. Different events take place in various parts of South Africa. All the discotheques, pubs and restaurants are completely booked. South Africans as well as tourists attend huge balls where they match their dancing steps and flow in the Valentine mood with different alcoholic beverages. People of South Africa like to visit wildlife parks and sanctuaries with their friends and families. Many other events like river rafting, mountaineering amidst the exotic islands of Cape Town and Johannesburg are main attraction of the day. Luxurious resorts gives the most enthralling view and rated as one of the best place to spend a romantic evening. Apart from this, a very popular small coastal village Hermanus is just the place to be. Grand festivities are marked in the city of Durban, where innumerable tourists flock in large numbers. Valentine’s Day celebration is a recent phenomenon in India but has caught the fancy of people to a great extent. Though some see it as a western import and hesitate to celebrate, there exist a large and growing number of those who love the feeling behind the beautiful and romantic festival. Especially to the Indian youth February 14 signifies love – a day when people express their affection for others. Just as several other countries, people in India too celebrate the Valentine’s Day by exchanging cards and gifts. Euphoria of Valentine’s Day festival can be experienced weeks before the festival. Television, radio and print media start creating hype about the festival by covering all facets of it. Gift marketers and card companies launch a rigorous campaign to lure the youngsters. Card and gift shops are interestingly decorated with symbols of Valentine’s Day including roses, cupid and heart shaped balloons. Shopping malls in metropolitan cities organize fun-filled competitions and distribute discount coupons to lure the consumers. On February 14, the Valentine’s Day restaurants, discos, Cineplex, pubs and pizza parlors see a particularly busy time as couples celebrate the day in togetherness. Many boys and girls even propose to their sweetheart on this romantic day. People also express love to their friends, teachers, siblings and parents. 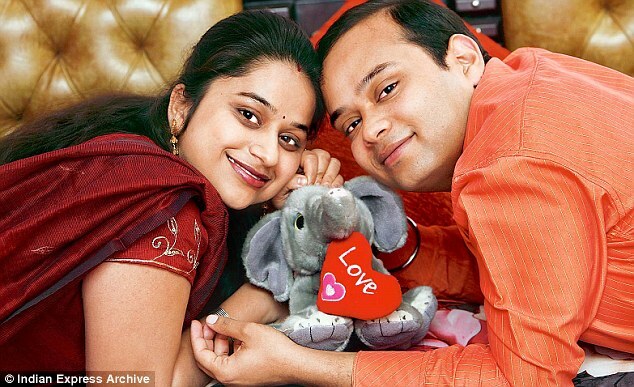 Popular Valentine’s Day gifts exchanged in India include chocolates, fresh flowers, cards, soft toys and candies. These are also clubbed with several other gifts to pamper sweethearts. People in China too have a day devoted to love but it is quite different from Valentine’s Day festival as seen in other parts of the world. Chinese Valentine’s Day fall on the 7th day of the 7th lunar month in the Chinese Calendar. Hence the day is also called as ‘Festival of the Double Sevens’ or Qi Xi – ‘The Night of Sevens’. The other popular name for the Chinese Valentine’s Day is ‘Seven Sister’s Festival’ and ‘Daughter’s Festival’. When the Cowherd went to the stream he saw all the seven beautiful daughters of the Emperor who had come down from Heaven to take a bath. 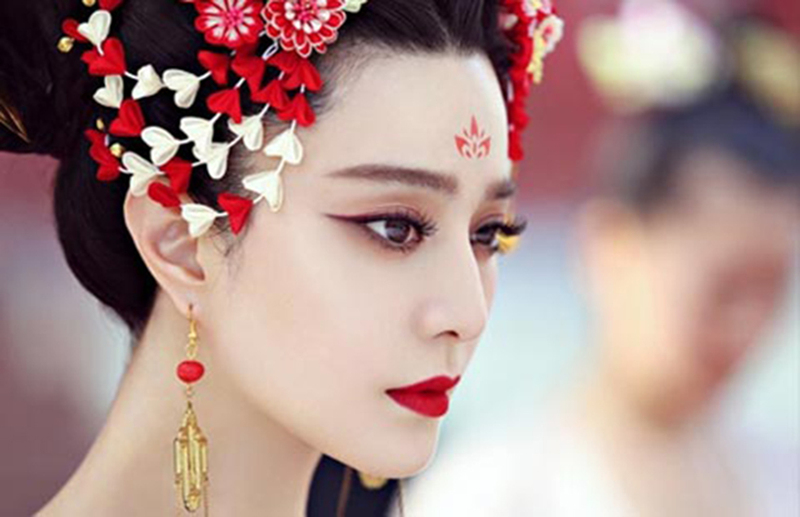 Niu Lang was captivated with the beauty of the youngest daughter Zhi Nu and secretly took away her fairy clothes. Without her fairy clothes the youngest daughter could not fly back to the heaven along with her sisters. The cowherd asked the fairy that he would return her clothes if she promised to marry him. The girl coyly agreed to marry the cowherd. They lived a happily married for several years and had two children. One day, the ox felt that his last day was near. He told the cowherd that he should keep his hide for urgent situation after he dies. Meanwhile, Emperor began to miss his seventh daughter. He sent Zhi Nu’s grandmother to bring her back from the earth. The grandmother succeeded in bringing Zhi Nu back to heaven. While the 7th Princess was being taken away to the heaven, the cowboy wore the ox hide and carried his two children in the two bamboo baskets with his wife’s old fairy clothes and chased his wife in the sky. To keep the lovers separated forever the grandmother created a Milky Way between them. The seventh princess was moved to the star Vega in the Lyra (Harp) constellation while the cowherd with his two children stayed in the star Altair (Flying one) in the Aquila (Eagle) constellation. The star Vega is therefore popularly known by the name of the Weaving Maid Star whereas the star Altair as the Cowherd Star in China. The mother took pity and two were allowed to meet only once a year on the 7th day of 7th lunar month. It is believed that on this specific day magpies form a bridge with their wings for Zhi Nu to cross to meet her husband. 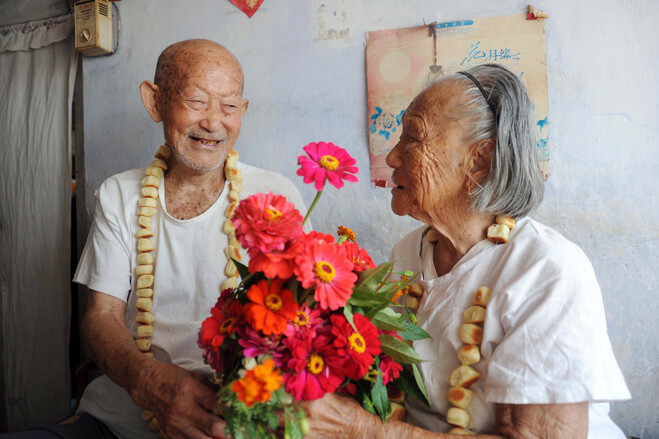 The celebrations of Chinese Valentine’s Day or Qi Qiao Jie – the seventh eve is quite different from usual Valentine’s Day celebration we see in rest of the world. There are specific and colorful rituals for the day besides the usual exchange of flowers, cards and chocolates as tokens of love between lovers. Following the tradition, lovers visit the Temple of Matchmaker on the Chinese Valentine’s Day and pray for their love and happiness and their possible marriage. Singles too visit the temple on the day and ask for their luck in love. The Chinese Valentine Day is also known as the Daughter’s Festival. Chinese girls always wished to learn a good handcrafting skill like the weaving maid. On the night of the Chinese Valentine’s Day, unmarried girls offer prayers to the Weaving Maid star and seek blessings to become smarter. When the star Vega is high up in the sky, girls perform a test by putting a needle on the water surface. If the needle doesn’t sink, it’s a sign of girl’s maturity and smartness indicating she is eligible to find a husband. Girl who passes the test may ask for any one wish. It is also traditional for young girls in China to demonstrate their domestic arts, especially melon carving, on this day. Chinese Valentine’s Day is therefore also known as The Festival to Plead for Skills, The Seventh Sister’s Birthday and The Night of Skills. In some provinces of China, people decorate the ox’s horn by flowers on the Chinese Valentine Day in a belief that the ritual will save them from catastrophe. Following the age old tradition women also wash hair to make them look fresh and shining. 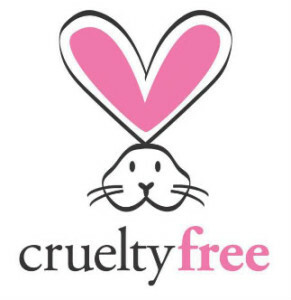 Children wash their face the next morning using the overnight water for a more natural and beautiful look. Stargazers celebrate the festival by looking up at star Vega on the east of the Milky Way which represents Zhi Nu, and at the constellation Aquila, on the west side of the Milky Way, where Niu Lang waits for his lover to join him. Tu B’Av, the 15th Day of Av, is both an ancient and modern holiday. Originally a post-biblical day of joy, it served as a matchmaking day for unmarried women in the second Temple period (before the fall of Jerusalem in 70 C.E.). Tu B’Av was almost unnoticed in the Jewish calendar for many centuries but it has been rejuvenated in recent decades, especially in the modern state of Israel. In its modern incarnation it is gradually becoming a Hebrew-Jewish Day of Love, slightly resembling Valentine’s Day in English-speaking countries. The Gemara (the later, interpretive layer of the Talmud) attempts to find the origin of this date as a special joyous day, and offers several explanations. One of them is that on this day the Biblical “tribes of Israel were permitted to mingle with each other,” namely: to marry women from other tribes (Talmud, Ta’anit 30b). This explanation is somewhat surprising, since nowhere in the Bible is there a prohibition on “intermarriage” among the 12 tribes of Israel. This Talmudic source probably is alluding to a story in the book of Judges (chapter 21): After a civil war between the tribe of Benjamin and other Israelite tribes, the tribes vowed not to intermarry with men of the tribe of Benjamin. It should be noted that Tu B’Av, like several Jewish holidays (Passover, Sukkot, Tu Bishvat) begins on the night between the 14th and 15th day of the Hebrew month, since this is the night of a full moon in our lunar calendar. Linking the night of a full moon with romance, love, and fertility is not uncommon in ancient cultures. 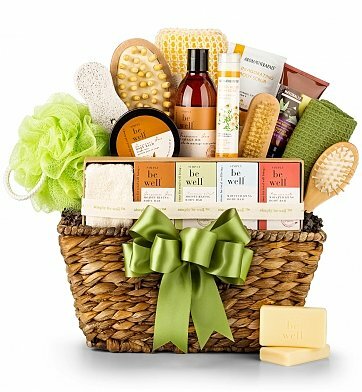 A nourishing and complete spa experience awaits the body, mind and soul with this abundant and expertly curated basket of wholesome, all-natural, organic, dye-free bath and body essentials. This fine rollerball pen offered by Bettoni Peruzzi, one of the world’s finest writing instrument makers, combines smooth rollerball style with distinctive, ergonomic comfort. 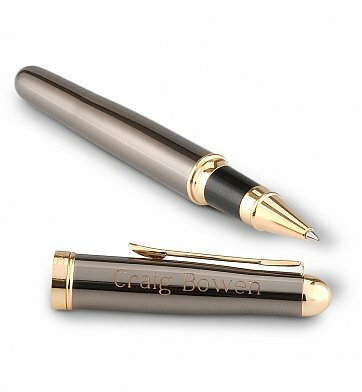 Enhanced by your chosen name or message engraved on the pen, it’s a thoughtful gift for congratulating, rewarding, thanking, or just because. Fragranced lavender bathing salts, olive oil moisturizers, a rustic citrus basil candle and more make this hand selected gift the quintessential collection of an ultimate spa experience. Hand-tied with a satin robin’s egg blue ribbon, it’s the perfect gift to offer someone who deserves a little pampering. Your selection of Moet & Chandon Imperial, Dom Perignon Brut, or Louis Roederer Cristal. Gourmet Chocolates from Ghirardelli, Godiva and Lindt. Camembert Cheese, Sea Salt Roasted Almonds, Savory Popcorn. 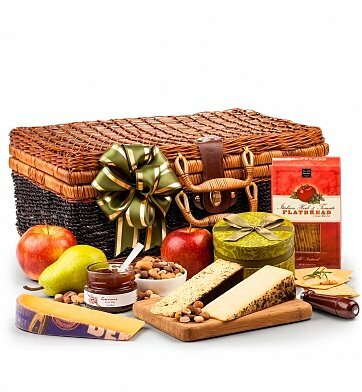 Enjoy a picnic of orchard-fresh fruit, well-aged artisan cheeses, fresh nuts and so much more, presented in an elegant hamper. It’s a perfectly delicious gift to celebrate any special occasion. 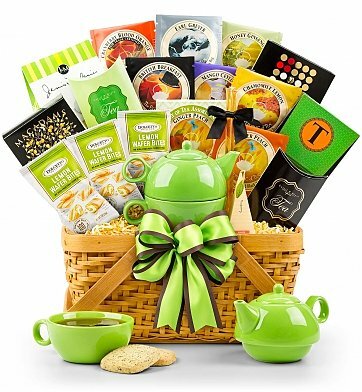 Overflowing with a wide assortment of organic teas, accompanying sweets, and their very own matching teapot and teacup set, this bestselling basket is perfect for delighting any tea-lover with a unique spin on traditional teatime.